Drew Brees and the New Orleans Saints were less than two minutes away from heading back to the Super Bowl for the first time in nearly a decade. 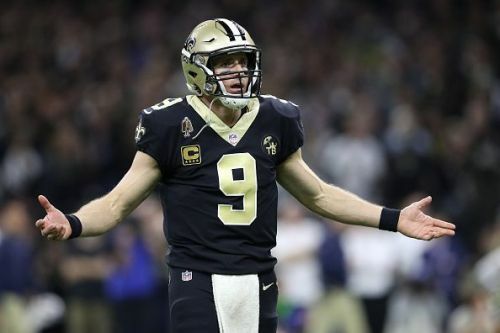 Having methodically moved the ball down the field to strategically burn clock, the Saints found themselves roughly 15 yards out of the end zone and in place to secure the NFC championship against the Los Angeles Rams. Tied at 20, the Saints were a first down away from icing the game and on a 3rd and 10 pass, Brees looked to have a wide open Tommylee Lewis in perfect position to come down with a grab that would have in essence finished the game. We can clearly see the defensive back not turn his head to play the ball before initiating contact (strike one), the defender initiating contact before the ball arrived (strike two), and all of this occurring on an extremely catchable ball (strike three). By not calling pass interference on the play, the clock stopped running and the Saints were forced into taking a field goal to give them a 23-20 lead. Instead of burning the clock out and kicking a field goal as time expired, the officials gave Jared Goff and the Rams 1:41 on the clock and a timeout to move the ball downfield and into field goal range. Coincidentally, this non-call came after the defensive pass interference call have taken over the league. With the recent rule changes, NFL referees have called a massive uptick in both defensive pass interference as well as defensive holding. With almost any minor contact being called as a pass interference call for the past two seasons, the discrepancy with this call is even more perplexing. That 1:41 proved to be more than enough time as Goff marched down the field and Greg Zuerlein booted the game-tying field goal to send it to overtime. Nailed it, the thing would have been good from 70. After the game, Saints head coach Sean Payton called the league office to offer them a piece of his mind. According to Payton, the first thing Senior VP of Officiating Alberto Riveron said was, "We messed up." Unfortunately, apologies from league officials can't change the outcome of the game. While there is a chance that Saint's kicker Wil Lutz may have missed that chip shot from the 3-yard line, those are the types of kicks that even your worst NFL placekicker hits (conservatively) 99 percent of the time. All in all, it was simply an ugly ending to what was otherwise one of the most entertaining football games of the year. How to Watch/Live Stream Super Bowl 2019 Online? New Orleans Saints' Demario Davis on working with United Way on "Character Playbook"